After I taught my last free motion quilting class, I decided I needed to rework the class a little bit to improve its effectiveness. I also needed new shop samples. The photo below shows my first new shop sample, which includes thirteen different free motion designs (twelve blocks plus one in the sashing). By focusing the class so that each student tries these thirteen designs, I am hoping students will have a clear goal and feel they have enough designs to use on their quilts until they gain the confidence to create their own. You can click on the photo and enlarge it to see the designs. On my computer I can then zoom in even further so the quilting patterns really show. 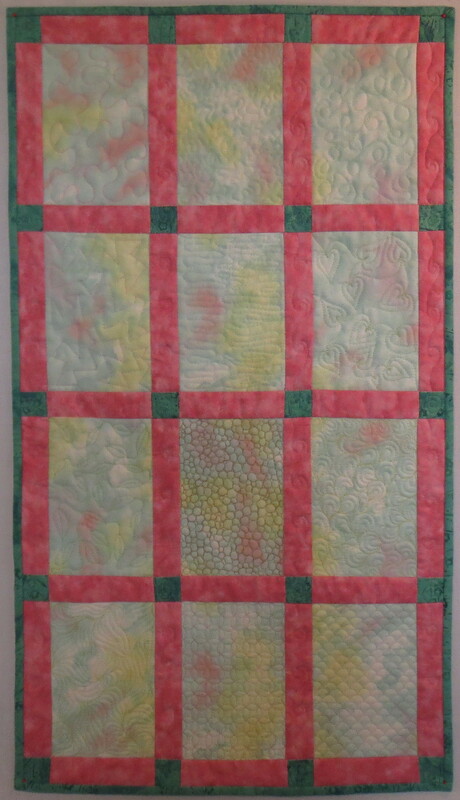 This entry was posted in Classes, Free Motion Quilting, Quilting, Quilting Classes and tagged Free Motion Quilting on June 18, 2013 by Shirley at Mystery Bay Quilt Design. I really like the sample – wish I could do it!